Holy moly it’s been a while since I’ve got all chatty up in here. But you know, December happened. Complete with The Great Hard Drive Failure of 2013, All of The Christmas Parties, The Massive Paperwork That Comes With Our Busiest Business Period, The Holy Crap If Im Going To Fit 4 Relatives In My House I Better Do A Lot Of Tidying Housework Blitz, and The How Did Christmas Get Here So Fast? Shopping Mania. But it did get here fast and I had a wonderful time. Mechanic Man and I stayed in Wellington for the first time since we moved here 10 years ago, and my parents and brothers came down and stayed with us. The weather was mostly crappy but the food, adventures, crafting, and especially the company were awesome. (I’d bombard you with photos but I’m sure you don’t care and I can’t be assed editing them. Use your imagination.) And now I’m slowly emerging from the chaos and getting my house and head in order for a new year. And I got an extra special Christmas present I can’t wait to tell you all about! Meet Minerva. Min, Minnie, or Minnie the Moocher for short. This is the first photo I took of Minerva, which I used to list her on petsonthenet. She’s not as photogenic as some kitties but I think she’s adorable. Look at those extra long whiskers! Min adopted us at Christmas. And by adopted us I mean turned up and demanded to live with us until we caved and said yes. I’m madly in love with her. We often have neighborhood cats wander through our yard. Most of them are skittish or shy and if you get too close they run away. Occasionally friendly ones will come by for a pat and a play. Mechanic Man and I love cats but MM has always been reluctant to own one so we take the pats from local kitties when we can get them. But we’ve always strongly felt that encouraging someone else’s cat to stray is mean, so we never feed neighborhood kitties and we never let them in the house. We thought Min was a neighborhood kitty. She’s super friendly and loves pats and would come by the yard every now and then for attention, and had been for a couple of months before Christmas. But we never fed her or let her in the house, and she never tried to get in. A few days before Christmas she came by for a pat and was rewarded with an outpouring of attention from my four newly arrived cat-crazy relatives. She started hanging around constantly and was never far away. After a couple of days we noticed she was sleeping in our little lean-to by the shed. We thought nothing much of it at the time. But then it all started to change when a couple of days before Christmas she started coming inside. Every time she was promptly chased out. We had a family meeting and agreed to lay off the attention so she’d be encouraged to return to her family. At this point Min was still being actively chased out of the house. You can see how terrified of us she is. She responded by turning up the demands. 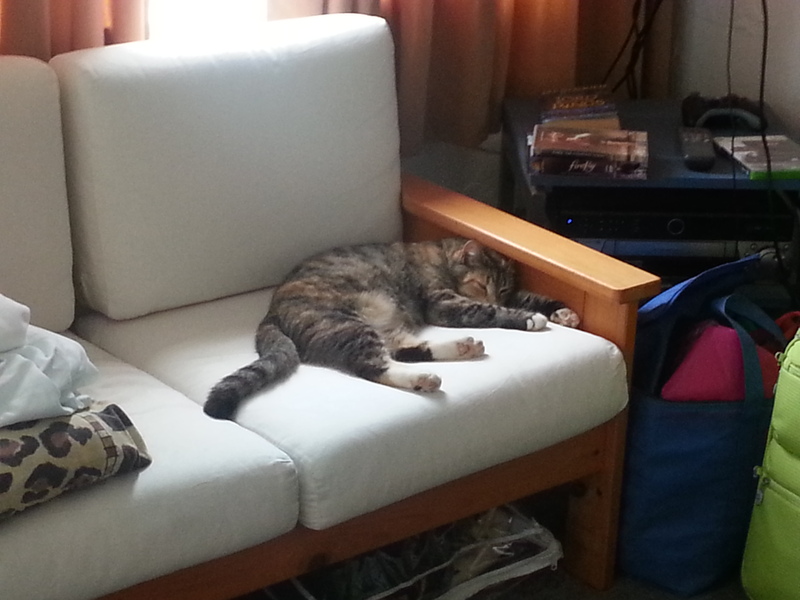 She came into the house constantly and started sleeping on our furniture. She’d mewl at us when we went past and started a new game where she’d run into the house then run straight to a different door so we’d let her out that side. I started to wonder if maybe she didn’t have a family after all. Then on Christmas Eve she cried outside for ages, on both sides of the house, and we could hear her trying to get in our locked cat flap. On Christmas Day we emerged to find her asleep on the deck under the cat flap. That day she jumped though Punk Flatmates window three times. She cried again that night and slept in the lean to. Still being actively chased out of the house at this point, although we were starting to give up hope. 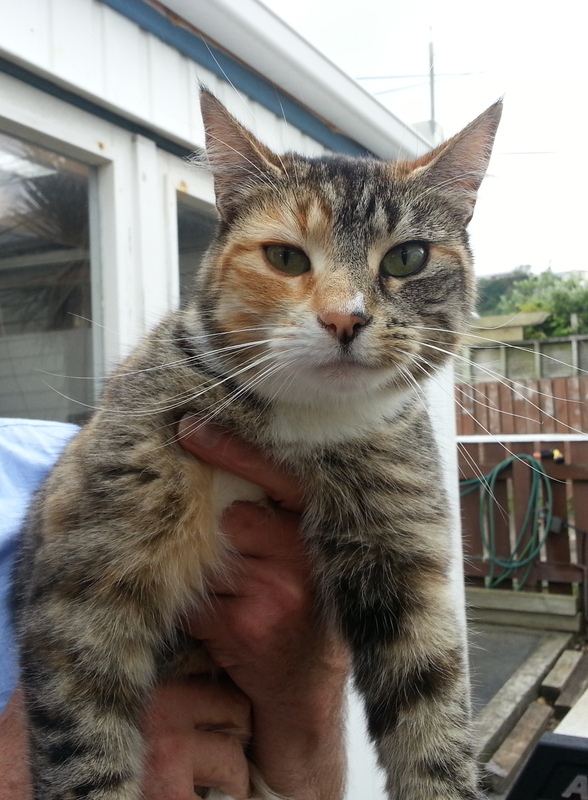 We didn’t want to encourage what was obviously a friendly, experienced domestic cat to stray and wondered why she was so reluctant to go home. We surmised that maybe her family had gone away for the holidays and locked her outside with a bowl of food and she was simply lonely, and although I was worried we decided to continue to keep her outside and not feed her, but that we’d keep an eye on her to make sure she was ok.
She stopped crying after only a couple of days, but then she got listless. Previously she’d always come running if you called her for a pat but now she wouldn’t leave the little bed she’d made in the lean-to and if you went to her she wouldn’t really move. We wondered if maybe her owners hadn’t left out enough food or had a catsitter who was unreliable. Torn between our duty to her owners and our duty to her, we discussed and agreed to feed her, outside only, and decide what to do next after New Years. Spot the cat. 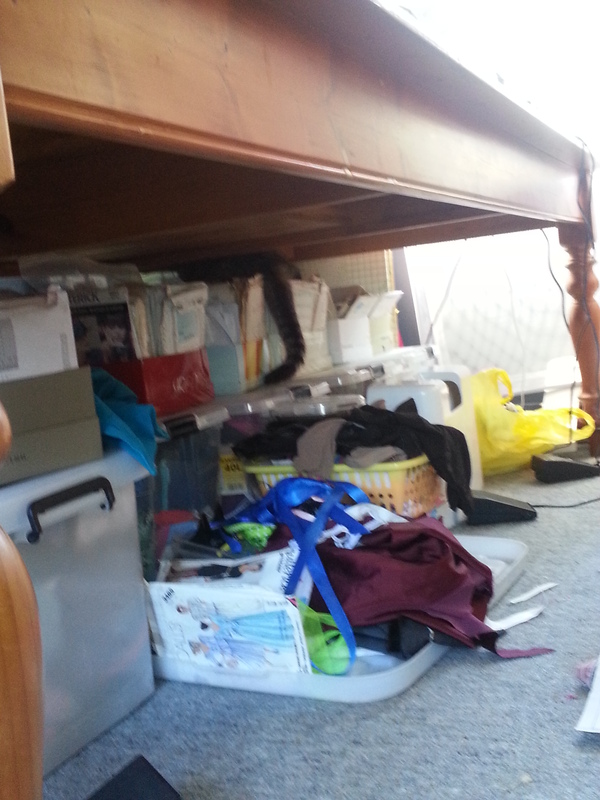 This is the somewhat messy under-the-sewing-table stash. At this point she’s still not allowed in the house. 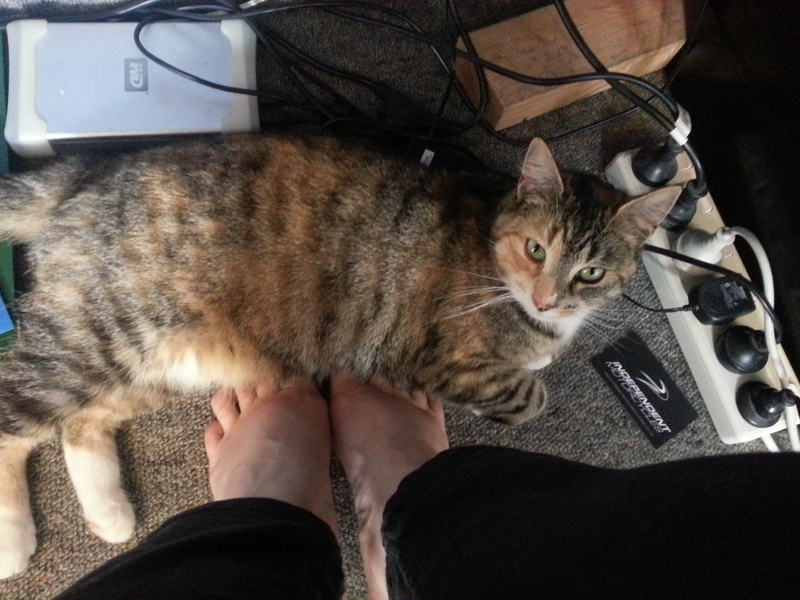 Of course, she responded to that by mooching around my ankles and then crawling in here. She was delighted to be fed and after a day or two perked up, back to normal. We still thought she must have a family somewhere, probably on holiday, and it was a temporary care arrangement so she still wasn’t allowed inside. Of course, that was quite irrelevant to her and we’d frequently find her in the house acting like she owned it. 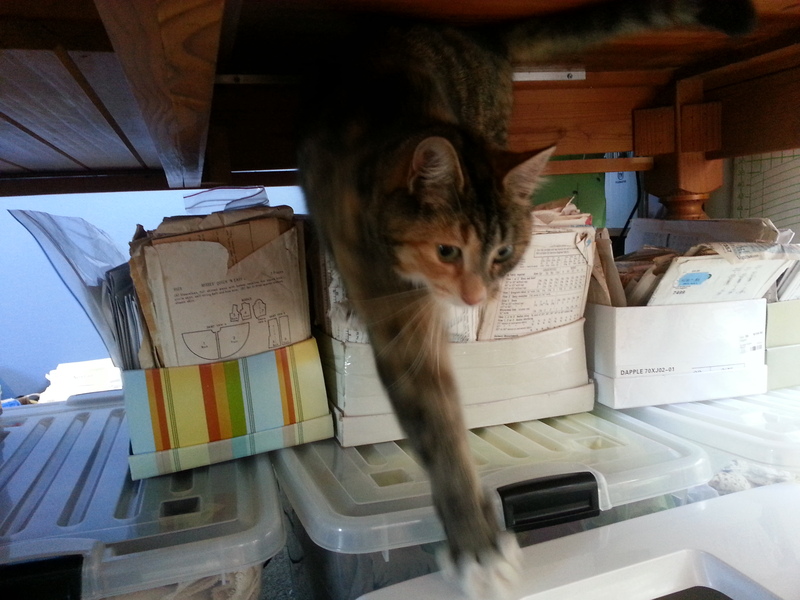 She was completely unafraid and attempts to chase her out were often met with a raised paw so she could lick her bum. A couple of days before New Years it bucketed down. Worried about her, we moved her food bowl from the lean-to to our conservatory and made her a wee bed with an old towel, and left the conservatory door open so she could gain access, and she happily moved into the new pad. But she still wasn’t allowed inside. This is the cat who is not allowed inside nonchalantly coming down off my pattern stash. I’ve since rearranged it so she sleeps on my contemporary not my vintage patterns. 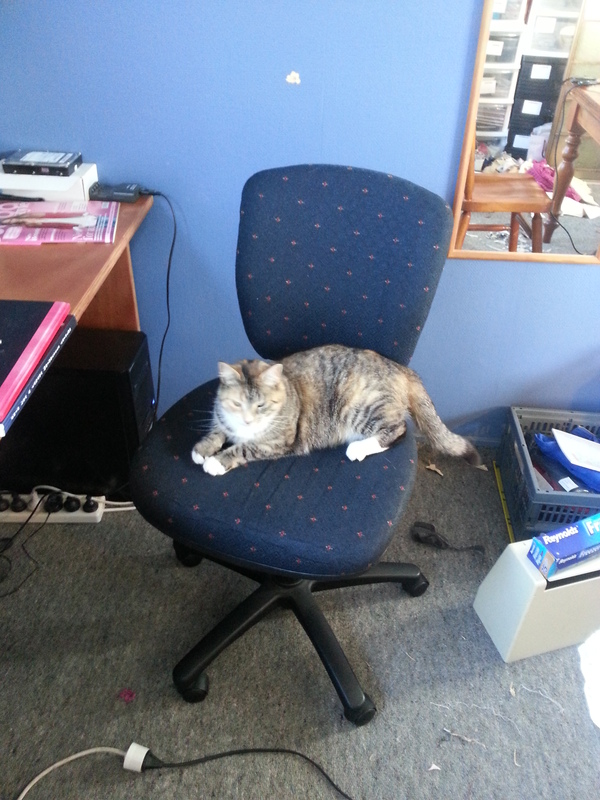 Over the next few days we put photos of her online at petsonthenet.co.nz, put an ad in the supermarket, and took her to the local vet to be scanned, which returned a nil result. I was reluctant to surrender her to the SPCA as they limit attempts to reunite to seven days, and with it being the holidays I was worried that wasn’t long enough to find her home. The thought of a family getting home from holiday to find their cat gone was enough to want to avoid this. So we kept feeding her, and re listing the online ad, and waiting. On 11 January I decided that I wanted to have her in the house. We’d either find her owners and then we would know where to return her to, or we would keep her. I begged Mechanic Man but he was still reluctant. Feeling that adopting a fur baby requires both parties to be willing I let it be. Then out of the blue, the following day, he let her in and brought her to me as I was doing paper work and she slept at my feet for about three hours. I was ecstatic. This is what she did for hours the day she was first allowed inside. Was the best way to do paperwork ever. That was probably the first day we started thinking of her as ours. But just in case she had a family nearby, after a week of having her in the house we put a collar on her with our number, assuming that they’d either cut it off or call. A couple of weeks later and she was still wearing our collar and no one had rung. But the day we truly acknowledged that we are now owned by a cat was in late January, when we were planning our annual budget. Mechanic Man piped up with ” we better budget for cat costs”. Well, if she’s in the budget, she must be ours. 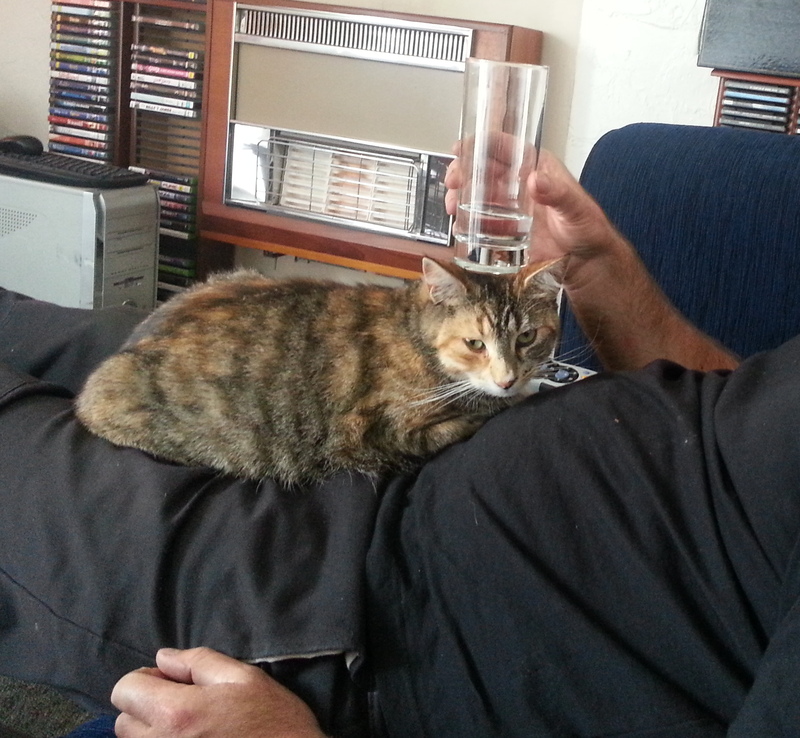 Making herself at home on Mechanic Man’s lap. He’s such a softie. I was too emotional to speak so Mechanic Man took the call. Long story short, they’re virtually our next door neighbours! Min had wandered off a couple of times previously as she wasn’t at all fond of the newly-mobile toddlers of the family, and this was the longest she’d not come home. They decided that she was probably much happier with us! And so she came back with us to her new home. And her original name? Vespa, appropriate, given Mechanic Man’s love of motorbikes! 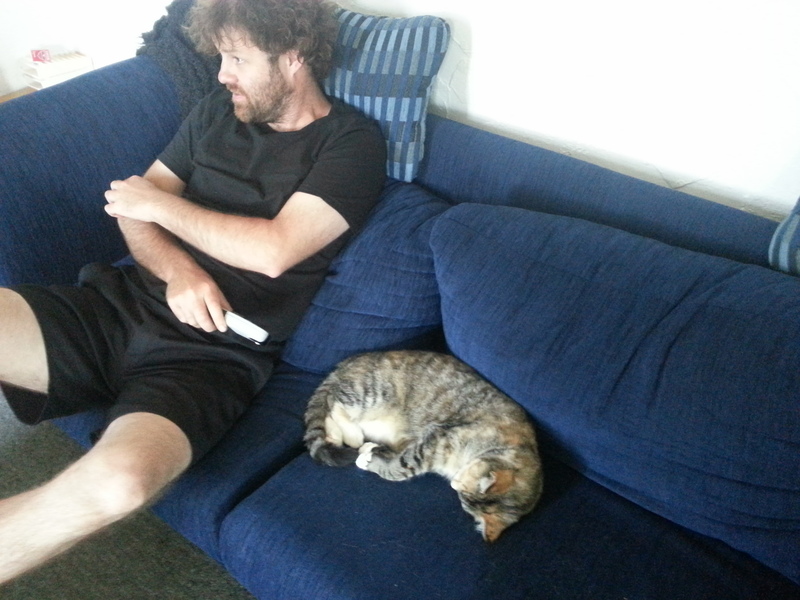 Settling in quite well for a weekend movie watching session with Mechanic Man. But we’ve kept the name Minerva. Why? Minerva is the Roman goddess of sewing of course. And Minnie the Moocher is a great nickname, given she’s mooched her way right into our lives and love. And that is my Christmas present from the universe. Minerva sleeps on our bed at night (although it took a couple of weeks for Mechanic Man to allow that), comes when she’s called every time, plays chasing games with us until we cry laughing, and meows around our ankles till we feed her. And she’s the only cat I’ve ever met who loves belly rubs. No tricks, no wait 30 seconds and then shred your hands, just purrs. In fact, if she’s outside in the sunshine she actively encourages belly rubs by stretching out on her back adorably. And she’s super mellow. We can tease her and she just relaxes and ignores us. We’ve spent hilarious minutes while she’s sleeping stretching out her legs and tickling her and patting her paws to see what will make her move. The answer is nothing. Min is so mellow and relaxed that she’ll tolerate anything. 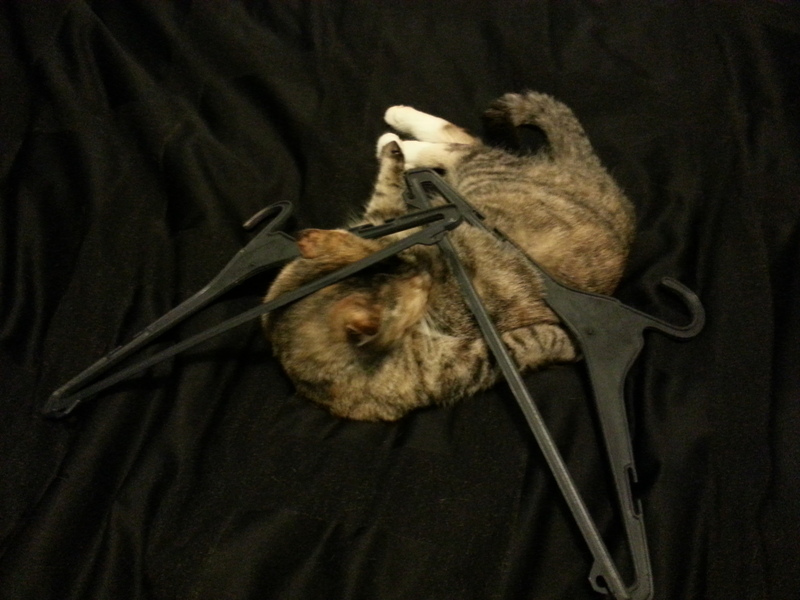 Like having coat hangers balanced on her head while she’s bathing. She just kept on licking. She’s wonderful. And she’s ours now. Or more accurately, we’re hers. And she knows it. 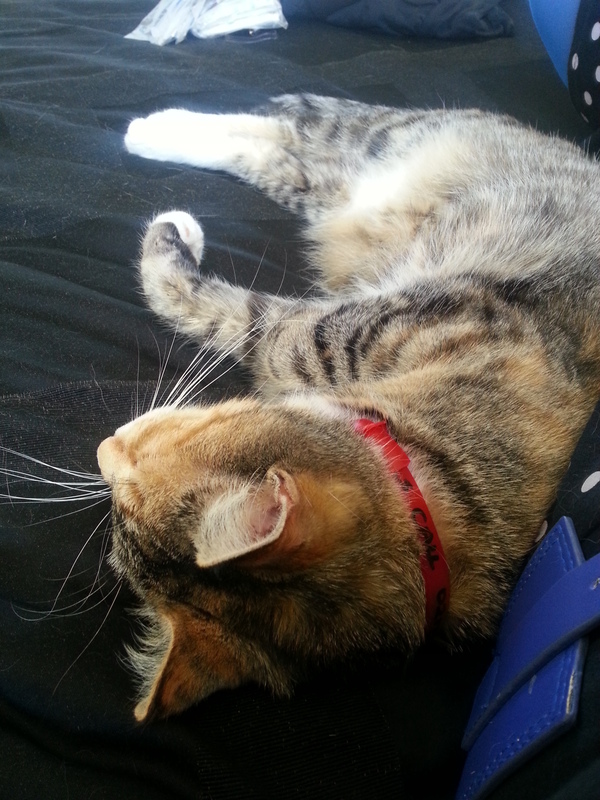 Minerva and I stretched out together for an afternoon snuggle.